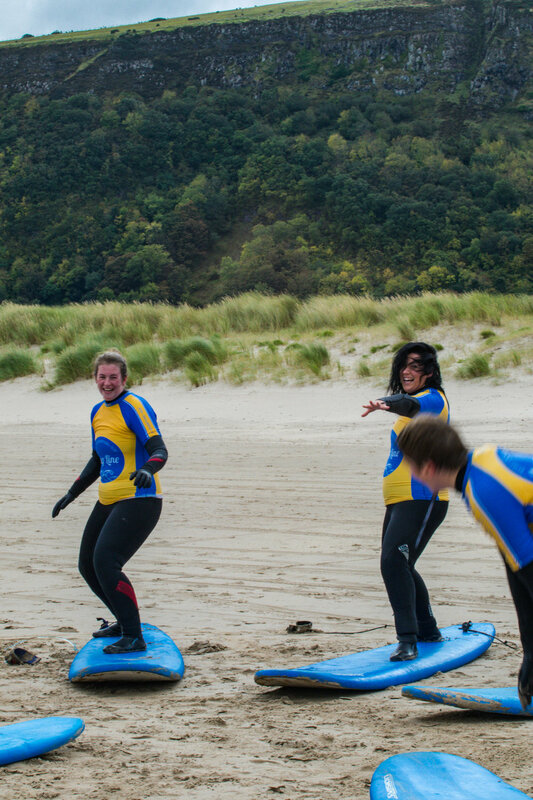 Learn to surf with us in Northern Ireland this December on our exclusive winter surf and SUP weekend. Set in an area of outstanding beauty this is the perfect spot for our wintery retreat. Surf, SUP, mulled wine, smores, roasted chestnuts and an open fire! ✓ Surfing and exploring a Game of Thrones Location! This December we’ll be heading to the Binvenagh area in Northern Ireland, an area of outstanding beauty with dramatic landscapes used in Game of Thrones, the perfect location for our wintery surf and SUP retreat. Working with a fantastic surf school, we’ll be learning to surf at Benone Stand, a 7 mile long sandy stretch with great waves for all levels. We’ll be stand up paddleboarding on a beautiful and tranquil river, stopping for coffee along route and a wild swim for the brave! We’ll be staying in a beautiful cottages with roaring open fires to keep us toasty post surf, warming up with mulled wines and smores over the fire, we can’t wait for this last adventure weekend of the year! Arriving in late afternoon to our quaint cottages. We’ll drop our bags and head out for a walk along the Benone Stand, a beautiful unspoilt 7 mile beach that will be home to our surf lessons this weekend. We'll stop of a drink at The Point Bar, in front of the open fire before heading back to our cottage for a wintery feast, including mulled wine and roasted chestnuts. Fuelling our first surf day with a full Irish breakfast overlooking the vast fields that surround our cottage. 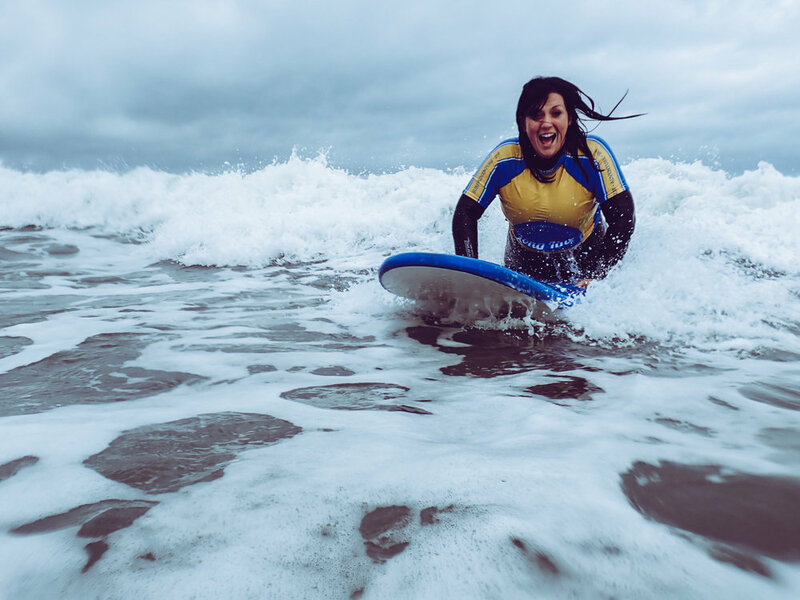 We’ll head to the beach for our first day of surfing, the long sandy stretch offers a great waves that are ideal for beginners to get to grips with surfing. This weekend is open to beginners surfers, from complete beginners who’ve never stepped on a board to beginner/intermediates who are getting to grips with standing and turning. Our excellent surf instructors have years of experience, we’ll have you up and riding as soon as possible! Breaking for lunch on the beach and refuel with a coffee at the Sea Shed, before heading back into the water for more surfing. For our afternoon surf, we’ll be heading to Downhill beach, used in the filming of Game of Thrones, this iconic stretch is a beautiful backdrop to our surf lesson. In the evening head back to our cottages to warm up by the fire and enjoy a delicious home cooked dinner before an evening with live Irish music in our cottage! Today we’ll have a continental breakfast in the cottage before heading out for the morning activities. We'll SUP on the River Roe today, after a short on land lesson we'll get onto the water to explore this area of outstanding beauty. This river location looks over the Binevenagh Mountain Range, used for filming in Game of Thrones! The retreat will wrap up around 1pm. Just 1 day off work for this adventure! We'll be staying two cottages side by side, surrounded by vast green fields and incredible views of Binevenagh. Each cottage has a lounge with log fire, kitchen and modern bathrooms! As they are traditional old cottages the rooms are nice and cosy with great views out on the fields. Great coffee from the Surf Shed! *single occupant, discount available for sharing. Thinking December might be chilly for surfing? We provide toasty wetsuits, hot drinks and the cottages have open fires to heat us after our surf! We require a 50% deposit to secure your spot, the remaining balance is due 4 weeks prior to arrival. We'll connect you up with the other Gutsy Girls who've booked in to see if your travel plans match up. It’s super easy to travel to us without a car too. Every guest has been amazed how straight forward it is! Trains run every hour most days. Got a question? Fill in the form and we'll get back to you ASAP! Ready to book - Please send me an invoice. Interested - but need a little convincing.